Picture this scene: if you could stand in the middle of the sidewalk during lunch hour in Midtown Manhattan without being pummeled by the hoards of people passing by, you would find yourself surrounded by suited men and heeled women hurriedly rushing from work to lunch and back again. It may not be such a strange scene to imagine if you live in Manhattan, the outlying boroughs or another big city, but when a Belgian friend of a friend of mine–who was visiting New York City, and the United States, for the first time–got thrust into this wild lunchtime world, she was shocked by the way these people rushed around, all the while entirely attached to their phones. In seeing it, she said, she recognized why Americans are such a stressed-out bunch; she was amazed by the way that work followed these crowds from their desks to the streets on their supposed breaks. While you won’t find me strutting around in heels, I sadly identify with this group much of the time, so when Aloyse shared her verbal description and physical depiction of her Midtown sight, I burst into laughter. What have we become that we scurry from place to place with our eyes glued to our phones' screens? Why do we commit ourselves to so much that we find ourselves–sometimes literally–running to our next destination? I can’t speak to your schedule and pace of life, but mine has skyrocketed to such a degree in the last week that in thinking back to what I looked like racing through the streets from engagement to engagement, I’m partially horrified and partly amused by the ridiculousness of it all. What do we really accomplish in all of that rushing around? Aloyse’s surprise at the American pace prompted me to speak with her about the trials of ‘keeping up’ with society today; I often feel as if I need to keep pushing in order to progress forward personally and professionally. However, is that really the only way to accomplish forward momentum? Is the whole of the States promoting this same vigor? Vermont certainly feels like different territory. 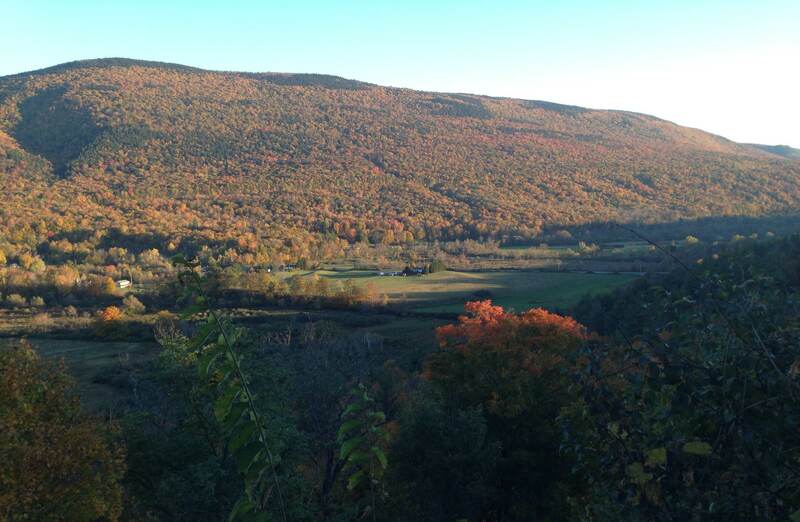 With its rolling hills and mountains, lush forests–of a vibrant fall palette during my visit a few weekends back–and low-key inhabitants, Vermont felt worlds away from the New York City that my boyfriend and I had left hours before to celebrate a friend’s wedding. To make the most of our weekend away, we spent our free time riding Stratton’s gondola up and down Stratton Mountain, hiking across the mountain’s peak, and embarking on our first-ever ATV adventure. With the wedding tossed into the 48 hours, the weekend was busy. And yet, the density very much differed from the craze of our city life. Living in a city of over eight million people can desensitize you to a degree. You can’t possibly interact with each person you pass by–nor would you want to–and while suburbanites and rural dwellers possess the safe space of a car to travel from place to place, we city people must resort largely to walking or public transportation to commute. The act of walking can become a means to an end much of the time. Vacation in and of itself can provide the time and space to settle into our surroundings more fully, but something about Vermont’s culture and natural environment furthers that opportunity all the more. The brush of the wind on my skin, the warmth of the sun in opposition to the coolness that crept into my body as we hiked deeper into the shade of the forest, the immense quiet that lay over the mountain as we parked our ATV beside our tour guide’s to relish a rainbow that had popped up beside the mountain’s edge…all of these moments bubbled up as such visceral experiences and thus were enormously satisfying. To be able to meet a moment and all that makes it up with such fullness made it almost impossible to breathe; such life was available at our fingertips. Time seemed to move more slowly there, and the visitors and residents of the area alike didn’t push you to depart before you wanted to. We all, in a sense, floated through the gorgeous landscape together, without a mind to what would come next. In a yoga class I took this past week, the teacher spoke of his attempts to explain ‘om’, or ‘aum’, to a curious man at a bagel shop he stopped into. He spoke to the way we are, at our very base, composed of atoms and how these atoms are constantly vibrating. To him, then, when we sound ‘om’ at the beginning or end of class, we are resonating even more fully with the inherent vibrations that make up each and every piece of our universe, from the tiniest piece of matter inside ourselves or other beings to the most humongous of structures. For me, the life that seemed to simultaneously pour into me and out of me in Vermont in these small, yet full moments seems to perfectly match this notion of vibration, of movement and vivacious energy. It’s something that I discover too on my mat space in yoga class, or in the midst of a performance. What seems funny to me in considering all of this, however, is how it often takes us slowing down–physically and/or mentally–to recognize the power that every moment holds. What’s the use of hurrying through our lives if it impairs our ability to grab ahold of life for even the slightest second, to breathe in all the wisdom and beauty that it offers? Getting quite sick a few weeks ago highlighted the benefits of slowing down for me; while I lay on the couch wrapped up in blankets, life continued on, but I wasn’t entirely dropped out of its current by stepping onto its bank. As soon as I stepped back into my daily activities, its force swept me up again. But as I flow along with each day’s stream, I think back to Callie’s mindbodybrew post last week, particularly her thoughts regarding choice and the bravery that going against your environment’s stream can require. I’ve wondered quite often, since Vermont and since being drop kicked by sickness, how I want to and can interact with life on my own terms, rather than those set by society. How can we have more of a dialogue with what is ‘expected’, so that we aren’t just strung along on a wild, stressful journey to meet others’ expectations, but instead, can find ways to vibrate with what resonates deeply within us, so as to witness and give to our surroundings more fully? Junot Diaz may consider art to be a slower of time for us (I certainly agree that art can be a powerful source of reflection), but how too can our yoga and meditative practices enhance our ability to converse with life–be swept away by it, stilled by it, and changed by it?